Marking your fabric is a standard part of sewing but understanding the different types of marking tools on the market is a totally different ballgame. Let’s explore our options and helpful tips on when to use. Whether you’re tracing a template or transferring pattern markings, the type of tool that works best will depend on the type of fabric you’re using and the purpose you need it to fill. Always test your marking tool on a scrap piece of the same fabric first, because you just never know when a mark is going to be stubborn and refuse to come out! It’s always better to be safe than sorry. Disappearing Ink Marker – This marker often has two ends – a water-soluble tip and a disappearing ink tip. If you use the water-soluble end, you’ll have to wash your fabric before you can get rid of the markings, but the benefit is that the markings will stay on your fabric for the duration of your sewing project. The disappearing ink doesn’t require washing, but it will (usually) disappear on its own so it may go away faster than you wanted it to. Tip: Choose the disappearing ink for fabrics that will show water damage. Caution: Make sure the disappearing ink has actually disappeared before you wash it, as the Sewing & Craft Alliance reports that detergent will permanently set this type of ink. Another warning from SCA? The chemicals in these markers deteriorate fabrics over time, so if you’re planning that heirloom quilt project, these might not be your best choice. Fabric Pencils – Fabric pencils are water-soluble like markers. The problem is that the lines they draw are often very hard to see, but the benefit to pencils is that you can always sharpen them to get a fresh tip and they won’t dry out. Tip: Use these pencils on darker fabrics; their light colors will be easier to see. Caution: If the pencil forces you to apply a lot of pressure in order to see the marks you’re making, get a new marking tool. Putting that much pressure on the fabric can warp the grain before you sew it. Tailor’s Chalk – Tailor’s chalk usually comes in the shape of a flat triangle or rectangle. Tailor’s chalk will rub right off the fabric when you’re finished with the markings, so it generally carries less risk than using a pencil or marker. The down side is that it can be messy, and sometimes the light coloring is difficult to see on light fabrics. Tailor’s chalk also comes in pencil form, which may be easier to use. Tip: Keep your tailor’s chalk sharp for thin lines. Caution: Some tailor’s chalks contain wax. Test with an iron on a scrap fabric to see if you can find a waxy residue left on your fabric after marking. Tracing Wheel and Paper – Roll a tracing wheel onto your fabric to create a series of small indentations that will serve as temporary marks. Similar to carbon paper, tracing paper transfers markings with applied pressure. Simply sandwich the tracing paper between your fabric and your pattern and then use the tracing wheel to mark over the pattern outlines and markings. Tip: Choose a color for your tracing paper that will show up on your fabric without being so dark that it shows through to the other side. Caution: Only use tracing paper on the back or wrong side of your fabric. Tailor’s Wax – Tailor’s wax is like a crayon you can use to mark your fabric. Since it is made of wax, you run the risk of staining your fabric. In theory it will come off with the heat of the iron, but that isn’t always true. Tip: Tailor’s wax can be very useful with a heavy or thick fabric, such as wool. Caution: Wax sometimes leaves residue on your fabric that can’t be removed, much like grease! 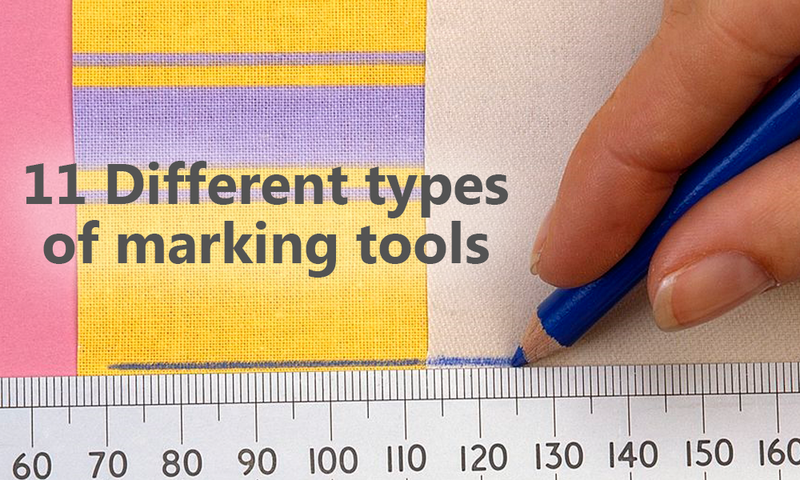 Can’t find your fabric marking tools but need to get that project finished? Don’t stress, instead head to your junk drawer for a quick rescue. These regular household items may be just what you need in a pinch. Like if your fabric tool has just run out. School chalk – Sharpen a stick of traditional chalkboard chalk using a hand-held pencil sharpener. Ballpoint pen – A ballpoint pen isn’t going to wash out of your fabric the way an actual fabric marking pen will but it works well in areas that won’t be seen. Drawing marker – Raid your kid’s art supplies and find a marker for your next sewing project. A washable marker should wash out of the fabric when you’re finished. Permanent markers – if you’re using a fabric that is particularly thick and nubby, such as fleece, a permanent marker might be just the thing you need. The sturdy, pointed tip will power through the bumps on the fabric and the line is sure to stay put when you’re finished drawing. Soap – A bar of white soap will draw on your fabric like tailor’s chalk, and wash out when you’re finished. Needle and thread – Some fabrics just won’t play nicely with any type of marking tool. In this case, thread a needle with a contrasting color of sewing or embroidery thread and use that to mark your pattern pieces. You can sew right through the thin pattern paper so your markings will be spot-on with accuracy. When you’re finished with the marked portion of your sewing project, simply snip and remove the extra thread. What about you? Do you have any favorite marking tools for sewing? If so, please share! I always like hearing about new ones!